Do you remember I was complaining the other week about the lack of control I had on my digital camera, well meet the new toy. 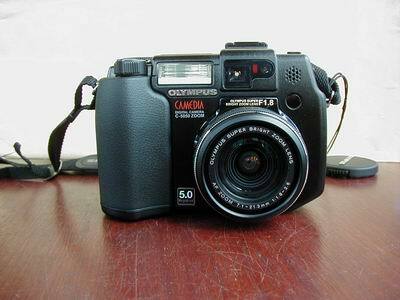 It is still an Olympus Camedia but this is the 5050Z with massive 5million megabytes. This is not the most important thing to me, as I doubt if I will ever use it even close to the maximum resolution that it is capable of, but I can now control the creative side of picture taking. This camera has several modes so that I can choose the aperture, shutter speed and where the focus is set if I want. I hope that you will notice an improvement in the pictures on the log over the coming weeks as I get to grips with the controls. I will share my trials with you as I start to experiment. These two pictures are more or less identical except the one on the left was taken at a slightly higher resolution than the one on the right, they were then reduced to the same size and stuck together. Can you see any difference? I can certainly get in close to my subject as it will focus down to 3cms in super macro mode, like looking down a microscope. This is the tiny shoot of Tropaeolum azureum just emerging through the gravel. It is approx. 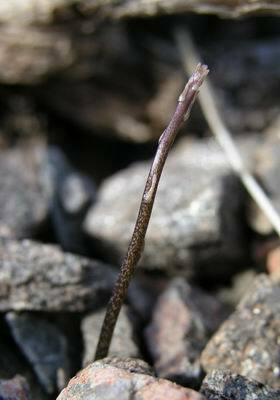 2cms long and you can see details in this picture that I cannot see with my eyes - like the tiny nodes and bracts along its length. In a few weeks I will cut the top off this shoot, I do this every year as it encourages the dormant buds at these nodes to shoot and I get a multi stemmed growth which results in a better plant. If you grow this plant it is very important that it does not dry out once growth has started or it will immediately go into a dormancy which can last several years. 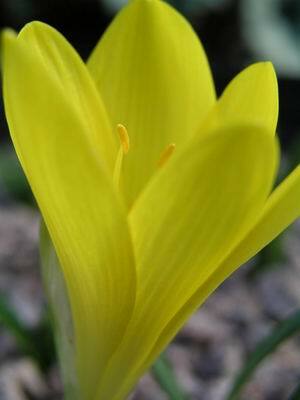 I can control the focus so well that I can even focus in on the anther of this Sternbergia lutea flower. 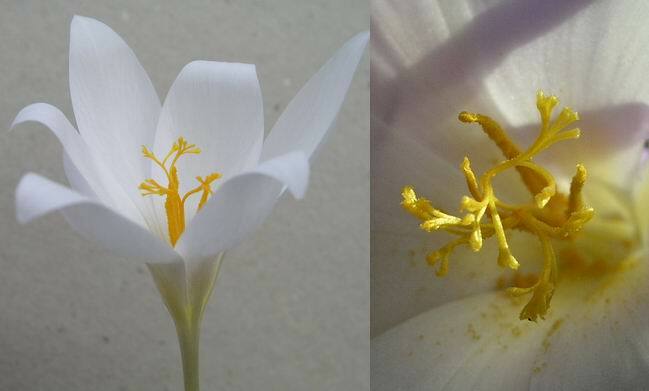 Crocus speciosus albus has just come into flower and it too has come under the lens in normal and macro mode, I am sorry but this is just too much fun to keep to myself. 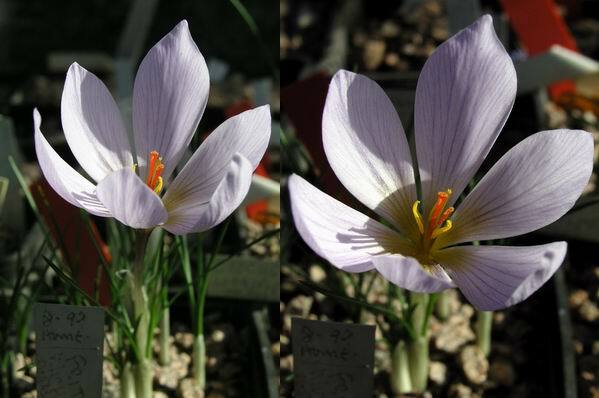 Two shots of Crocus hadriaticus lilacinus. 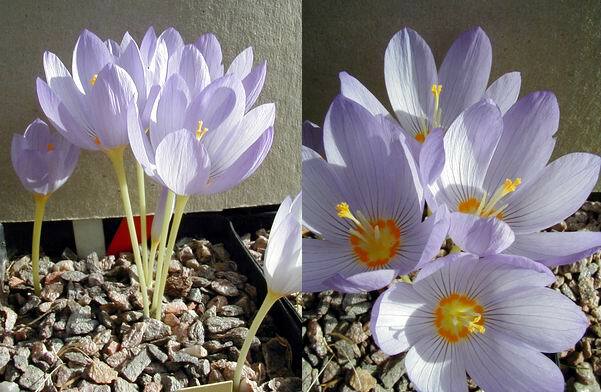 After I showed a picture of Crocus niveus in log 39 I received an e-mail from Anthony Goode who suggested that it might not be niveus but hadriaticus. 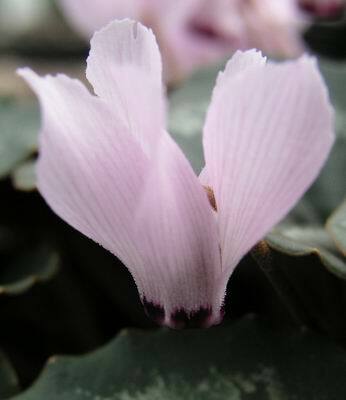 As I replied to Anthony I have a lot to learn about the Autumn crocus, I find some very confusing to sort out. It is reassuring that even experts that have visited us in the Autumn are not that keen to offer names for many of these little treasures. It is always easier in the wild when the distribution of a species is known and you can narrow down the field. Now niveus and hadriaticus are close but after some reflection and a bit more looking I think that Anthony is correct and it is probably a form of hadriaticus. 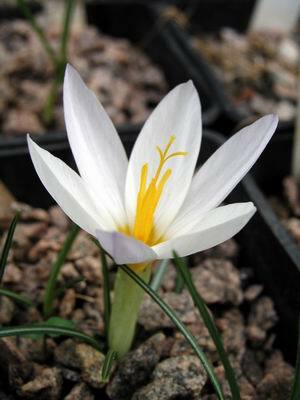 This one I am sure is Crocus caspius. 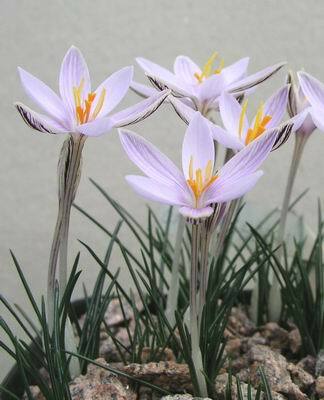 Crocus kotschyanus is a very good bulb to grow as it will do as well in the garden as it will in a pot. And to finish off this weeks' log this is one of my very favourite autumn crocus flowers.